Colombo Cricket Club (CCC) led by former Sri Lanka cap Ashan Priyanjan won the 2018-19 Premier League when they defeated NCC by five wickets at Colts grounds in the final match of the Super Eight concluded yesterday. Left with a target of 290 to chase CCC got their in 57.3 overs with Priyanjan and Wanindu Hasaranga finishing off the match for the Maitland Crescent club in style by indulging in an unbroken 68 runs partnership off 8.3 overs. Priyanjan finished unbeaten on 60 off 65 balls (3 fours) and Hasaranga the dominant partner an aggressive 48 not out off 27 balls inclusive of three sixes. SSC who were also in the running for the title going into the final weekend on second place with 1.3 points separating them from CCC suffered a shock defeat at the hands of last year’s champs Chilaw Marians CC who chased down a challenging target of 366 thanks largely to a match-winning 206-run stand between Risith Upamal (112 not out) and Nimesh Vimukthi (120) who scored his maiden first-class hundred. Their partnership lifted Chilaw Marians from a position of defeat at 92-5. 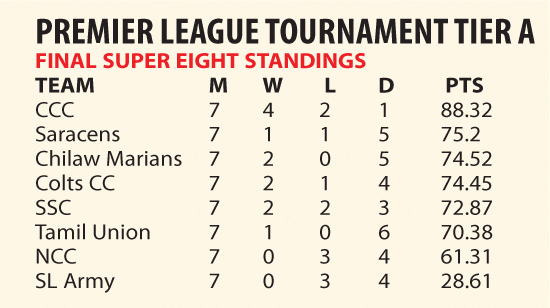 The win enabled Chilaw Marians end in third place pushing SSC to fifth. SSC’s defeat meant that Saracens SC who were placed fourth going into the final weekend finished as runner-up when they took first innings points off Tamil Union piling up a massive 574-9 declared after dismissing their opponents for 330. Saracens SC were without their captain Milinda Siriwardana and Kasun Rajitha for this match – both on national duty in South Africa with the Sri Lanka team. Saracens hopes of pulling off an outright were thwarted by Tamil Union captain and former Sri Lanka Test opener Tharanga Paranvithana and Sachitra Serasinghe who figured in a massive stand of 283 for the third wicket. Paranavithana went onto score 175 off 225 balls (20 fours, 1 six) and Serasinghe 124 n.o. off 199 balls (8 fours, 2 sixes).